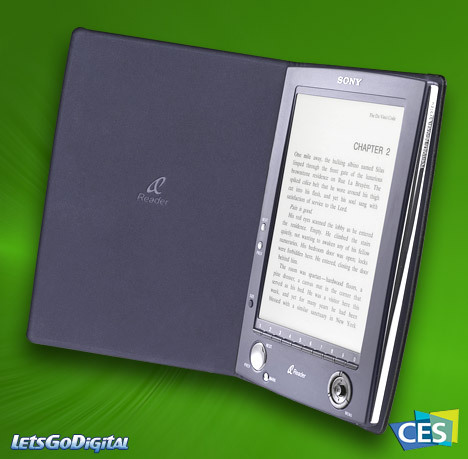 The Sony Reader is expected to bring a whole new meaning to "book smart." Coupling an innovative electronic paper display with precise one-handed navigation and a stylish, durable design, the Sony Reader will allow active readers to carry as much as they want to read whether they are traveling on the road or just around the corner. Roughly the size of a paperback novel, but thinner than most (about .5 inches thin), the device can store hundreds of books in internal memory with the addition of an optional Memory Stick or Secure Digital (SD) card. The electronic Reader can also store and display personal documents in Adobe PDF format, favorite web content like blogs or news feeds, and JPEG photos. Sony eBook reader - Digital content - With a seemingly limitless battery life equivalent to roughly 7,500 page turns, avid readers can devour a dozen bestsellers plus War and Peace without ever having to recharge. "In recent years millions of people have become comfortable downloading and enjoying digital media, including eBooks. But until now, there has not been a good device on which to read," said Ron Hawkins, senior vice president of Personal Reader Systems marketing at Sony Electronics. "Our research has shown that people are looking for a device designed exclusively for immersive reading. 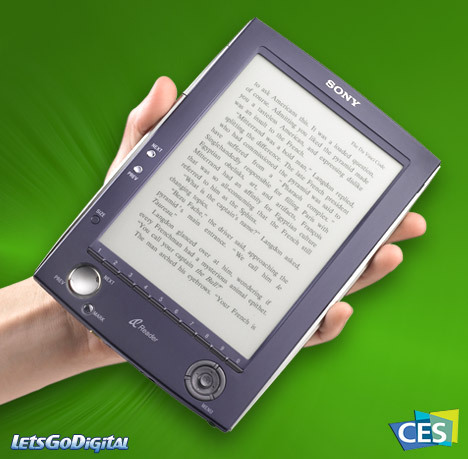 The Sony Reader with its electronic paper display, thin format and extraordinary battery life fits the bill." Sony electronic paper display - High resolution - Part of the magic behind the Reader's viewing experience is the high-resolution electronic paper display technology, which delivers a realistic print look that rivals traditional paper. 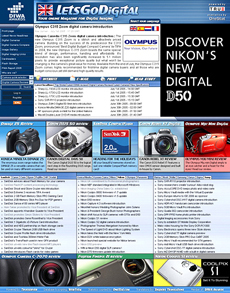 The result is readable text and graphics from a variety of viewing angles, even outdoors in bright sunlight. Since there is no backlight, readers will not experience the fatigue associated with long term reading on an LCD. And, as the technology renders each page as a static image, there is no flicker or constant screen refresh to add to eyestrain. Users with impaired or limited eyesight will enjoy the Reader's fully adjustable text size, which can be magnified or reduced on demand. Sony Connect - Reader online support - Sony Connect will support the launch of the Sony Reader by providing an online store integrated into an easy-to-use desktop application called the Connect Reader. The software will allow users to search and browse through thousands of downloadable eBooks, manage purchased eBooks and easily transfer them to the Sony Reader device. At the outset, the Connect Store will offer a broad selection of fiction and non-fiction, bestsellers, well-known authors, classics and more, with rich descriptive content in the form of author biographies, expert book reviews and reader commentary. Additionally, the Connect Store will offer online content sourced via RSS (Really Simple Syndication). Electronic book - Online content - "Reading books is a vital part of the overall reading experience, which also increasingly consists of written content from online news sources, blogs and other forms of web content," said Lee Ali Shirani, vice president of Sony Connect. "Connect will allow users to take eBooks, news feeds and other online media and enjoy that portably, thereby making the Reader the portable device for all things text." Booklovers will applaud the broad selection of eBooks already available for purchase and download to the Reader device. Many of the world's leading book publishers, including Random House, HarperCollins Publishers, Penguin-Putnam, Simon & Schuster and Time Warner Book Group will support Sony's e-reading initiative. Many independent and specialty publishers will also have eBook titles available for purchase and download to the Sony Reader. Manga comics and graphic novels from innovative houses such as TOKYOPOP are rendered beautifully on the device and will also be available for download.